There’s only one thing I don’t like about this method. It has one step which isn’t intuitive, and makes it all seem like magic. When you have a coefficient in front of the term that isn’t one, you have to divide the factors by that number. And then you do “bottoms up” where the gets converted to . I don’t like that you have to randomly divide by a number, nor that the implicit implication is that . A fellow math teacher at my school taught me to teach a very similar method, but that uses factor by grouping. You could write it also and it would work. .
That’s the first of a 4-part series. Sam, thanks for your blog – I learn a lot by following your posts. Please take my comments as those from someone who has much less experience teaching math than any of you, so I welcome your feedback. However, I am genuinely trying to understand the purpose of emphasizing factoring so heavily in teaching algebra. I believe that students should be challenged to do difficult mathematics, but it just seems like there are more interesting topics on which to spend time. You, my dear Pete, are asking precisely the question that so many math educators ask. In a day and age where we have Computer Algebra Systems which can do so much work for us, should our efforts go towards the routine or the problem solving? Indeed, factoring seems to be one of those really “hot” topics of debate. So I can’t quite give a good answer, because I’m not sure exactly where I lie on the spectrum. Part of me thinks factoring is so crucial, because HELLO: FUNDAMENTAL THEOREM OF ALGEBRA! And because routine mathematical skills are an important basis for a larger structure — and students need to know what and how these CAS are able to get the answer. The other part of me is saying: FOREST AND TREES! FOREST AND TREES! If we want our kids to appreciate the forest of mathematics, we can’t keep showing them one tree after the other, heading this way and that, leading them in this curricular maze, where by the time they reach senior year, there isn’t any larger structure to it all. And so CAS use could promote a birds eye view of the forest. I will say that I just found the ‘bottoms up’ method from the same blog and I like it. I had taught the factoring by grouping and for my students it did become too many steps and it wasn’t something they seemed to remember. I don’t have any data about how they’ll remember the new method, but I like that they have a visual and a name to think back to. Maybe it’s just because I don’t have kids that wonder why. They would rather have a process they can more easily remember. I saw something very similar, and the guy who showed it to me called it the “Surrey Method”. I asked him to generalize it, and he came up with a proof. I spent a long time on the proof, because I also didn’t like the step you referred to which made the whole thing seem like magic. I hate to admit, but I’m not entirely sure I understood the proof well enough to say whether or not it held. I’ve taught factoring using both methods. Problem is that using the diamond to split the 7x into 6x and x doesn’t seem any more intuitive than the bottom’s up method. They both seem magical to me. I’m not a fan of teaching algorithms for their own sake, but I’m not sure how to teach factoring differently other than have students list factors of a and c and then guess and check. I don’t have a better way than to have students list factors of a and c and then guess and check either. And I should also say that I don’t dislike bottom’s up. If it works, heck, it works! So @Sean, keep it up, if they remember it! But I do think that in terms of once you have the 6 and 1, factor by grouping makes it less algorithmic and more mathematical. I guess I don’t see factor by grouping magical, except for the “magic” way of finding the 7x=6x+1x. But both use that. I teach as you do, Sam, but I just call it “reverse FOIL” since, if you FOIL, you write down the same lines, just backwards. My students have a bit of trouble with this method, though, when the 2nd of the factors is negative and whether to factor that out or not and all that. So, I either have to say always put the negative factor first or “if you do it right, the next to last line should have matching parentheses,” but then it just becomes another in an already long list of rules for them. Because the kids who don’t do this weel are the kids who don’t really care about “why” in Algebra II, so they just memorize the “rules” anyways. I’ve responded to this post as well, and seem to agree with everyone else that it’s close, but the fraction manipulation is a bit hinky. Sure, it works, but do the kids (not you) understand why? In the diamonds above, where does the 6 come from? 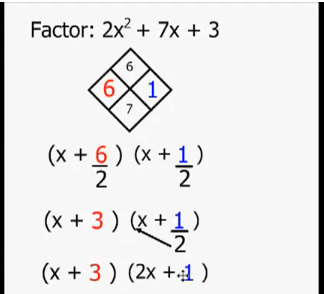 I use the factor by grouping method and I love that it reinforces factoring out a GCF, means that 4 term polynomials are factored basically the same way as 3 term ones, and provides confirmation while they are working it that they are doing it right. When you get those matching binomials in parentheses, you know you are right. Plus, I like how it matches FOIL, so they can see the side-by-side of doing and undoing which is such a theme in Algebra. At my school, the bottom-up method is known as “My Father Drives A Red Mustang” which stands for Multiply a and c, Factors, Divide by A, Reduce, Move. This might be a bit tough for some kids. However, I am a big fan of the box method. This is such an important concept for kids since it is a foundation for future math learning. I personally love FOIL because after decades I still somehow remember it and am able to apply it without any problems. Those mnemonics really stay with you!